THE number of solar power firms going bust is rising rapidly – leaving thousands of customers in the lurch. Companies blame energy efficiency schemes and grants being cut by the Government, resulting in a “significant reduction” in work. The Renewable Energy Association reports a “dramatic fall” in solar installs, plunging by more than 76% since 2016. A 30% decline in solar panel prices in the past three years is another factor which has led firms into financial difficulties. The situation has affected families such as the Tracys from Banchory, Aberdeenshire. They now want to warn others about what can happen when signing up to a solar firm. 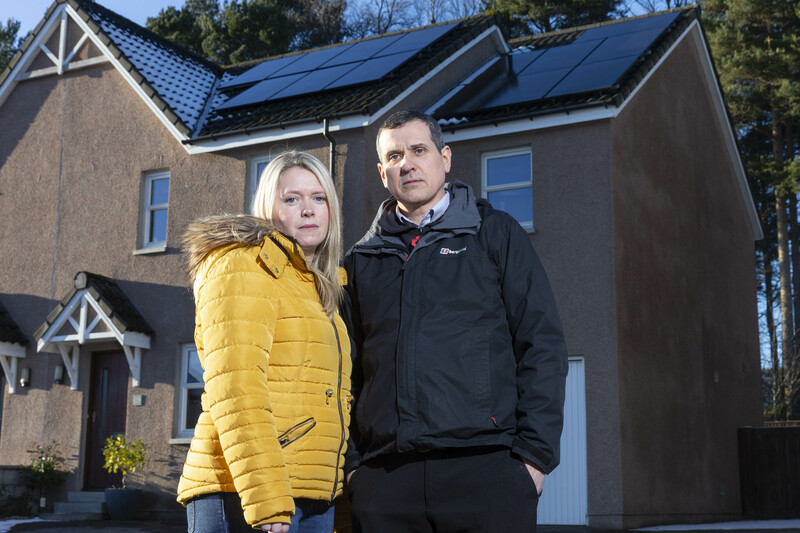 In September 2017, Lynne and Kevin Tracy had solar panels and heaters installed by Glasgow-based Solar PV Energy Solutions. “This cost more than £9,000 and we have had nothing but trouble since,” said Lynne. She explained that not long after the solar equipment was fitted two of their three new wall heaters weren’t working. “An electrician fixed the heaters – one had been fitted to the correct energy tariff but two hadn’t,” said Lynne. “We contacted the company as we didn’t seem to be getting a lot of hot water, even when the booster device was on. More visits from the company followed in an attempt to fix other snags with the hot water supply. The Tracys thought going solar would reduce their outlays but were shocked when they received an electricity bill for £500 more than normal. In September and October last year the Tracys again had no hot water. A device called an iBoost, used to control the water temperature, was replaced a number of times, to no avail. “After yet another visit from the company we were told the heating mechanism wasn’t compatible with our boiler,” said Lynne. Records at Companies House show a recent proposal to have Solar PV Energy Solutions Ltd struck off the register. At their wits’ end, the Tracys contacted Raw Deal for help. We tracked down the company’s former manager, John Gorman, and he said the firm had recently gone out of business and nothing further could be done for the Tracys. “We were at their house on numerous occasions trying to fix the job, and the issue with the hot water was caused by me,” Mr Gorman said. “We were never in the game to let people down but unfortunately there now is no business. Kevin, 47, said he now wished he had never decided to go solar in the first place. “We are furious as we feel we were mis-sold this system which is unsuitable and are gutted that we are left with £9000 to pay off and nowhere to turn,” he said.